Early books of hours have types of pictures and decoration which tend not to appear in ones made later on, after the programme of subject matter for pictures and decoration became established. This book of hours includes unusual pictures and texts, such as the Hours of the Holy Spirit and of the Passion, which were exceptional in a prayerbook of the mid-13th century. Some of the texts were recommended in contemporary treatises for the devotions of anchoresses, suggesting that it was made originally for such a religious woman. Its calendar of saints' feasts include many that were associated with the West Midlands. The Hours of the Virgin was a gathering of Psalms and other biblical texts. It had been part of the prayerbook used by monks but became the core of the book of hours. 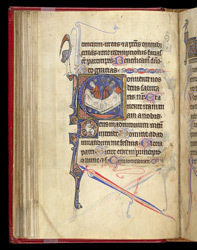 This page shows part of the Hours of the Virgin, the beginning of the prayers for compline, or bedtime. The picture within the first letter of the prayer shows two men preparing beds, the dark blue background and lamp with red flame setting the scene at night. This Book of Hours presents scenes of daily activity rather than the other types of scenes which developed in the programmes of decoration in later examples. The small images of animals and bizarre creatures are typical, however, of contemporary fashion in manuscript decoration.